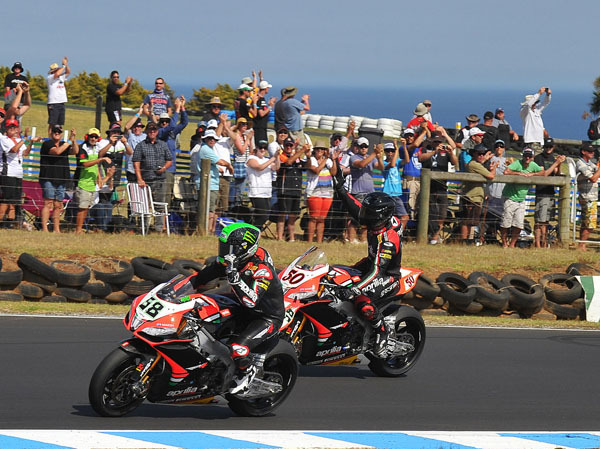 It could not have been a better day down under for Aprilia Factory Racing as they walk away with a double 1-2 and a 1-2 in the championship. Laverty lead for a vast portion of the first race, only to be overtaken by his team mate towards the latter end of the race, challenges by Michel Fabrizio for second place gave Guintoli the opportunity to disappear into the horizon to claim his 4th world superbike race victory. In the second race, the pattern was reversed, Guintoli got to the front and led a large portion of the race. Laverty and Melandri were scrapping for second place, Laverty shoved back to third with three laps left. However, the Irishman made one last push for victory on lap 20, passing Melandri and then attacking his team mate for the lead into Doohan’s. It was evident Laverty had more left to give than Guintoli in the last 2 laps, as he set the fastest race lap ever around Phillip Island. “It’s great to start off with a win!” said Guintoli, who rode his 80th WSBK race in Race 2, “Quite honestly, after the tests I know I could do well and from the start my intention was to give it my all. My goal has always been to win, but sometimes you have to adapt to conditions. However, today the setting was good, I didn’t have any serious concerns about tyre duration and everything went according to plan. In the first race I didn’t get off to a good start and I lost a few positions, but lap by lap I found the right pace to move forward. Eugene had gotten away well and when I overtook him I managed to keep the distance and take this important win. In Race 2 Eugene had a bit more than me in the last laps. He employed a strategy similar to the one I used in the first race, but this is a fantastic result for the team even if we are just at the beginning of the championship”. Laverty said “We got off on the right foot, all the work from the past few days has paid off. My Aprilia was fast and it performed as I wanted it to from the first to the last lap. In Race 1 I may have been a bit too conservative with the tyres, still taking a nice second place, but in Race 2 I pushed a bit more decisively. At the end, when it was Sylvain, Melandri and me, I tried and was able to get away, shaving a few more tenths off my pace. The track record two laps from the finish was nice confirmation that we turned up to the races in the best possible conditions. 45 points after the first race are some nice spoils. I’ve never started a season this well and now we’ll be thinking about Aragon and how to stay on this path”.